Early Epigenetic Nutrition ‘Memory’ Could Program You for Obesity Later in Life | What is Epigenetics? For decades, we’ve known how important it is to receive proper nutrition during early stages of life. Nutritional experiences in the beginning of development can set the stage for many things, including body weight, and can even affect the risk of obesity as we get older. Recent research supports the idea that poor nutrition at the beginning of pregnancy or while a baby is nursing can be stored as molecular epigenetic “memory” on the child’s genome, potentially setting them up for metabolic diseases later in life. Numerous studies reveal a connection between epigenetic marks, such as DNA methylation or histone modification, and human obesity. New research in Nature Communications investigated a form of persistent epigenetic memory that may play a role in the developmental programming of obesity. As one of the most complex and fastest-growing areas of research in biological science, a wide array of studies delves into the nuances of epigenetic memory of nutrition. Researchers have demonstrated the inheritance and transmission of epigenetic marks across generations, but others have shown that the epigenetic transfer of nutrition memory ends before great-grandchildren. The contentious topic still requires further research, but numerous studies have begun to illuminate the ways in which early life choices might epigenetically influence our health and the health of our children later on. Epigenetic research has shown that a son’s mental fitness could be influenced by his father’s diet even before the child is conceived and that the Mediterranean diet during pregnancy could epigenetically reduce a kid’s disease risk. Still, there is much more waiting to be uncovered. A group of researchers from Tokyo Medical and Dental University (TMDU) add to the collection of studies on the persistence of epigenetic marks over time. Previously, they discovered that milk lipids which are released during lactation after a mother gives birth act as a ligand that activates the nuclear receptor PPARα, or peroxisome proliferator-activated receptor alpha. Peroxisome proliferator-activated receptors (PPARs) are ligand-activated transcription factors involved in regulating many biological processes, including the metabolism of lipids and glucose, overall energy homeostasis, and inflammatory responses. This particular transcription regulator, PPARα, plays a key role in liver fat metabolism and, in mice, is essential to preventing the liver from storing large amounts of fat. Want to know how different foods epigenetically influence health? 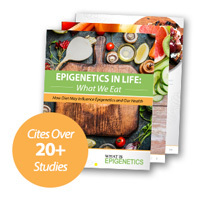 Check out our e-book Epigenetics in Life: What We Eat, which cites over 20+ epigenetic studies. By activating PPARα via milk lipid ligands, fatty-acid β-oxidation genes in the postnatal mouse liver become naturally demethylated. DNA methylation is a popular epigenetic mechanism known for switching genes off and reducing their expression. Administering a synthetic PPARα ligand (Wy) to mother mice during the perinatal period led to a greater reduction in DNA methylation of these genes in the liver of the mice offspring. The researchers confirmed that Wy was present in the breast milk of the mothers and ingested by her children. SEE ALSO: Could the Mediterranean Diet During Pregnancy Epigenetically Reduce a Child’s Disease Risk? With these findings in mind, the team utilized genome-wide DNA methylation analyses to explore whether the methylation status of PPARα target genes persists from early life to adulthood. Indeed, they found that a few of these genes which underwent ligand-activated PPARα-dependent DNA demethylation during the perinatal period persisted as the mice turned into adults. Among the genes investigated, which the researchers referred to as “epigenetic memory genes”, they focused on fibroblast growth factor 21 (FGF21). FGF21 is a peptide hormone which plays a critical role in regulating energy homeostasis. Essentially, once DNA methylation status of FGF21 is established in early life, it could affect obesity in adulthood. The researchers suggest that the suckling period is a critical window of time for PPARα-dependent FGF21 demethylation to occur as a result of maternal environment. With further research we can continue to unravel the mystery of nutritional epigenetic memory and get closer to understanding how early life experiences may set us up for positive or negative health outcomes much later in life. Source: Yuan, X., Ogawa, Y. et al. (2018). Epigenetic modulation of Fgf21 in the perinatal mouse liver ameliorates diet-induced obesity in adulthood. Nature Communications, 9(1). Reference: Tokyo Medical and Dental University. Epigenetic Modulation of Fgf21 Gene in Early-Life Ameliorates Adulthood Diet-Induced Obesity. TMDU Press Release. 6 Mar 2018. Web.